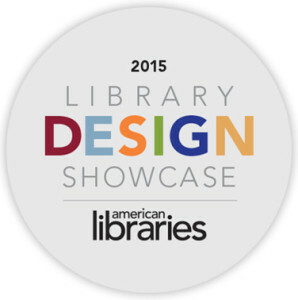 Welcome to the 2015 Library Design Showcase, American Libraries’ annual celebration of new and renovated libraries. These are shining examples of innovative architecture that address user needs in unique, interesting, and effective ways. 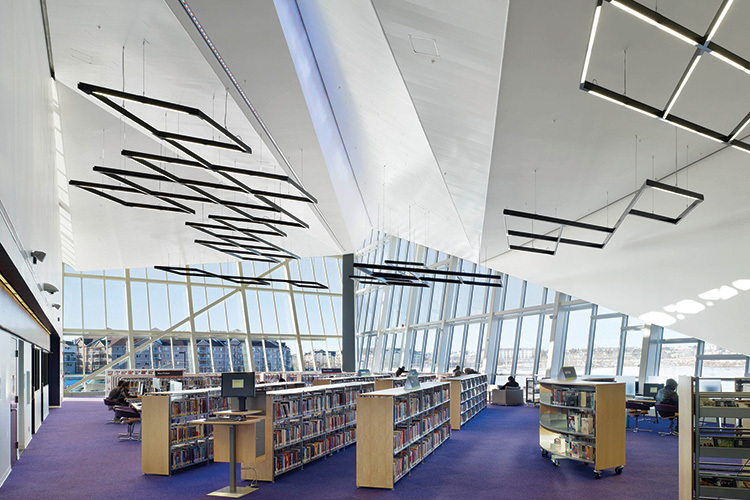 New construction dominated this year’s submissions, but renovated and repurposed spaces were a close second, showing how today’s libraries are both conserving existing resources and adapting to economic realities. Built in 1910, the John Hay Library at Brown University was brought into the present with recent renovations. 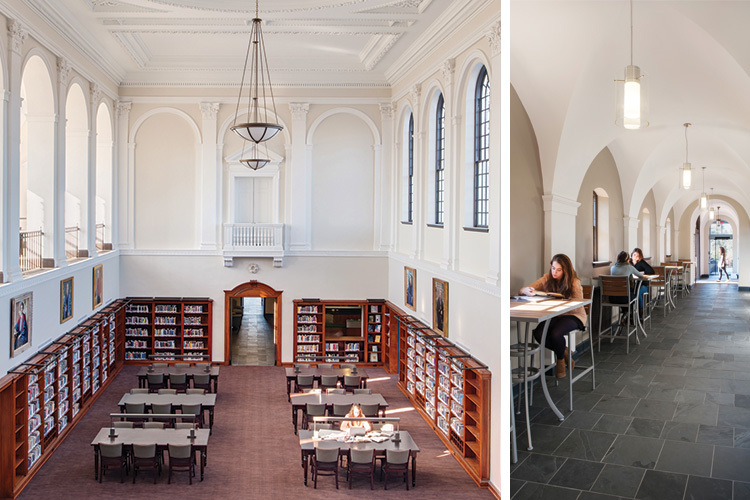 In addition to enhanced research spaces in the main reading room and special collections room, the library added a new ADA-accessible entrance and safety and security features that are integrated into the historic building’s original architecture. 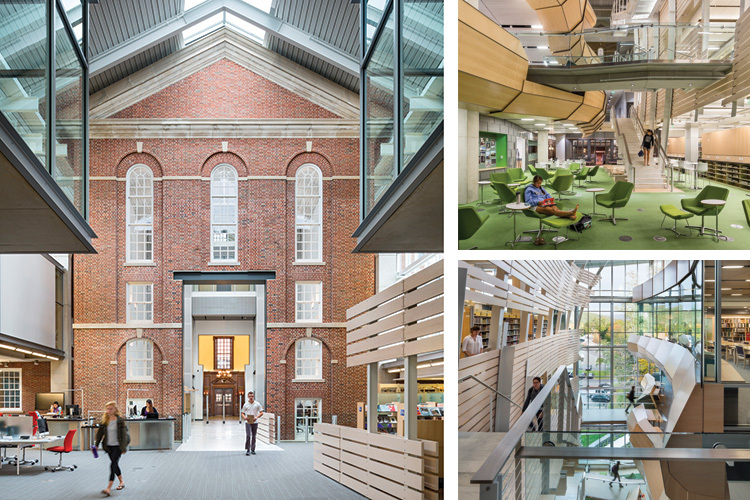 The massive library complex at Williams College is a marriage of the traditional and modern. After demolishing a 1970s-era library building, the college united the historic Stetson Hall with a modern five-story facility housing the new Sawyer Library, the Chapin Library of Rare Books, and the Center for Education Technology. 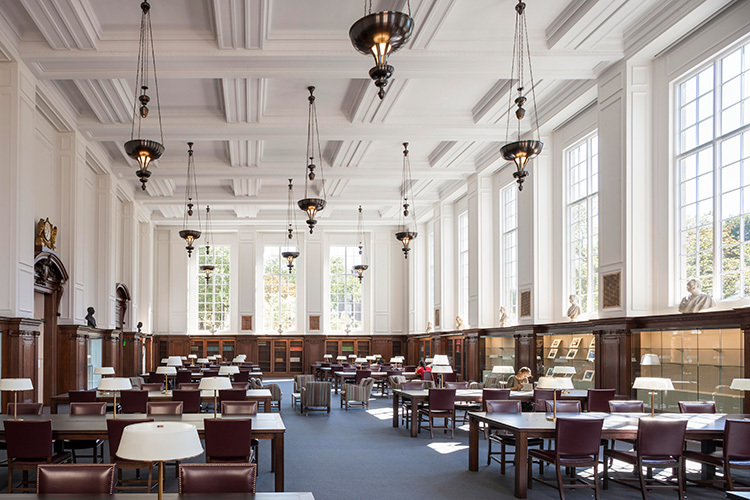 Renovations to the 1929-built Mary Helen Cochran Library restore the building to architect Ralph Adams Cram’s original vision. A 1967 wing that obscured Cram’s design was replaced with a structure built from masonry, slate, and brick used throughout campus. 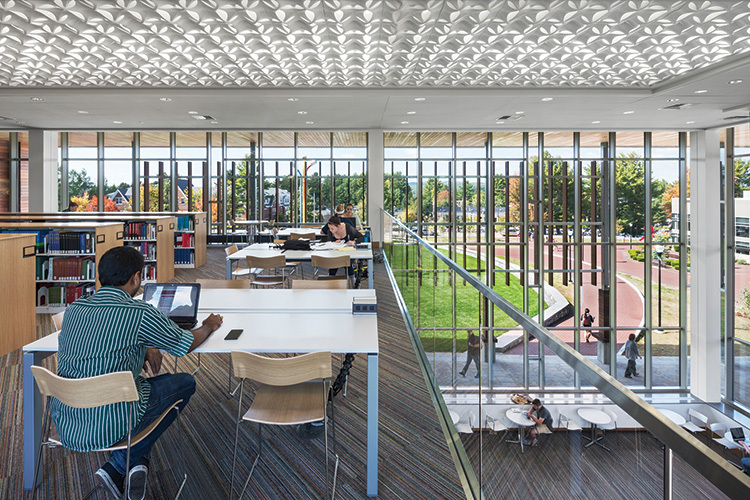 The addition enhances sightlines to campus and increases interior natural lighting by opening up windows blocked by the old construction. Architect: VMDO Architects, P. C.
The Southeast Branch of Nashville Public Library is housed in a former J. C. Penney department store. Sharing the space with a community center, it has a makerspace with 3D printer and a 24-hour-accessible lobby with touchscreen displays to access downloadable materials. 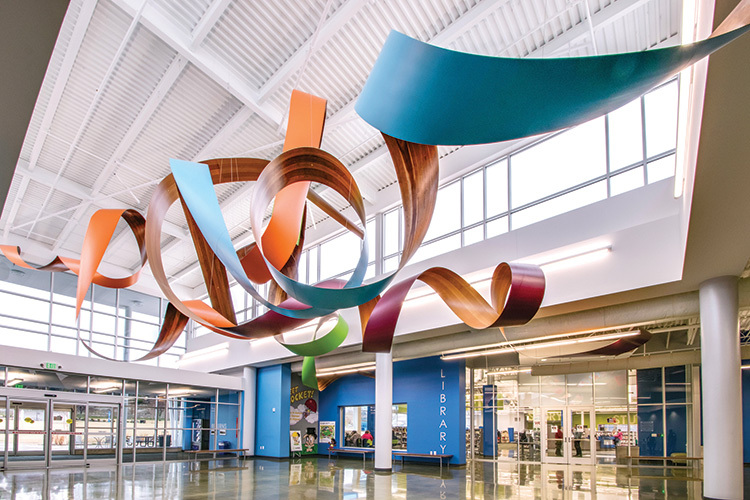 HBM Architects transformed a steel structure built in 1988 that once served as a building supply store into the Northside Library. Warm colors and bright accents disguise the space’s former use, and new skylights and a glass wall bring natural light and transparency to the facility. Pikes Peak Library District breathed new life into a space vacant for decades, creating a hands-on learning facility with 3D printers, sewing machines, video game development capabilities, a 400-seat venue for presentations, audio and visual recording studios, and an e-help center. The City of Edmonton and Edmonton Public Library joined forces to create a joint branch library and recreation center. 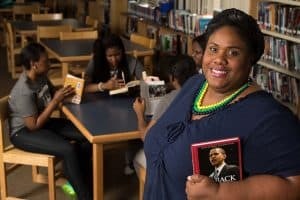 The facility has become a transformational force, offering library and learning services and social and cultural activities to a neighborhood with lower-than-average household incomes and rates of secondary education. 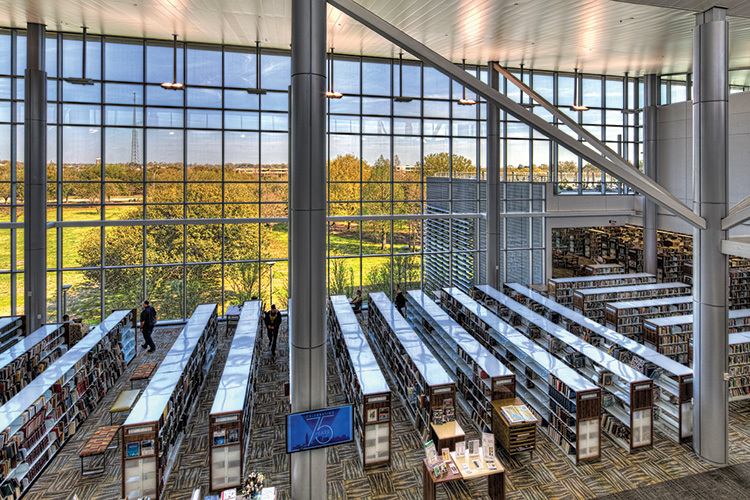 The Mitchell Park Library and Community Center replaces two outdated facilities. Designed with community input, the LEED Platinum–certified building looks to the future with vibrant colors, bold architectural elements, and abundant light. To celebrate the community’s heritage, a large existing oak tree in the courtyard has been incorporated into the building’s design. Architect: Group 4 Architecture, Research + Planning, Inc. 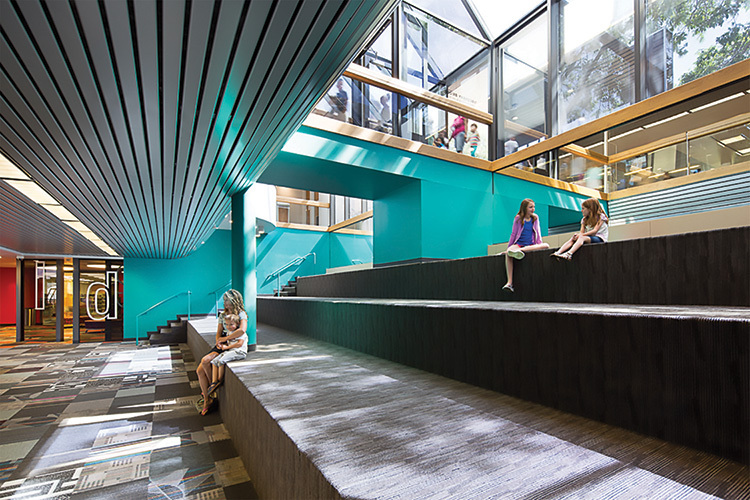 The second floor of the Central Library’s Johnson Building has been transformed into a kid and teen wonderland awash in natural light and bright colors. 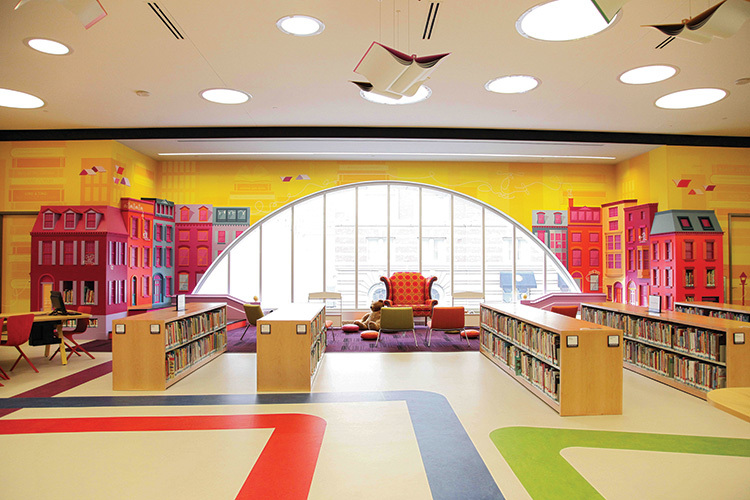 The kids’ area features new storytime spaces and a tween area, while the teen area is tech-friendly, with a digital lab, a media lounge, and homework and hangout booths. 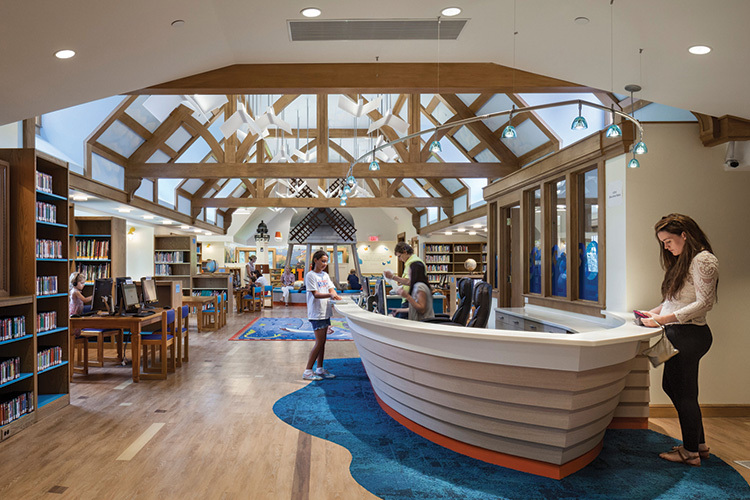 Architect: William Rawn Associates, Architects, Inc.
East Hampton (N.Y.) Library channels the East Coast’s seafaring history into its kids section with a reference desk shaped like a boat, two 10-foot-tall model lighthouses, hanging lights shaped like seagulls, and a local map on the floor complete with a sea serpent and Native Americans canoeing across Peconic Bay. Monroe County (Ind.) Public Library transformed its movie and music areas into two state-of-the-art digital creation centers. 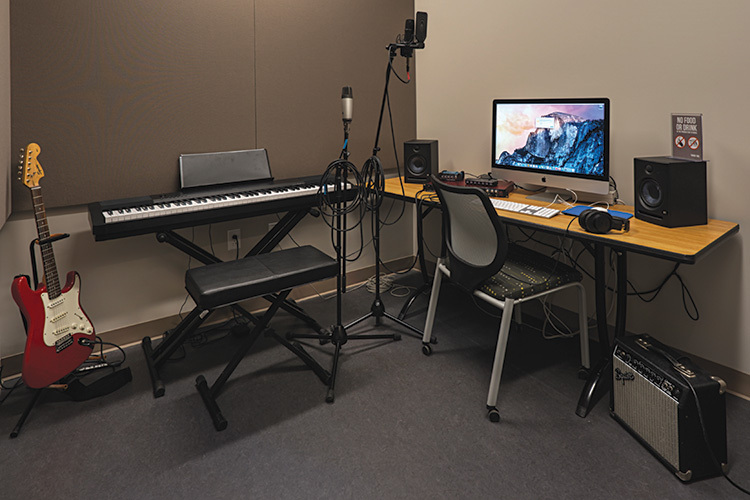 The ground floor teen space encourages collaboration with its open modular design, while the second floor houses a green-screen video production studio and two soundproof audio recording studios. Main Library, Monroe County (Ind.) Public Library. 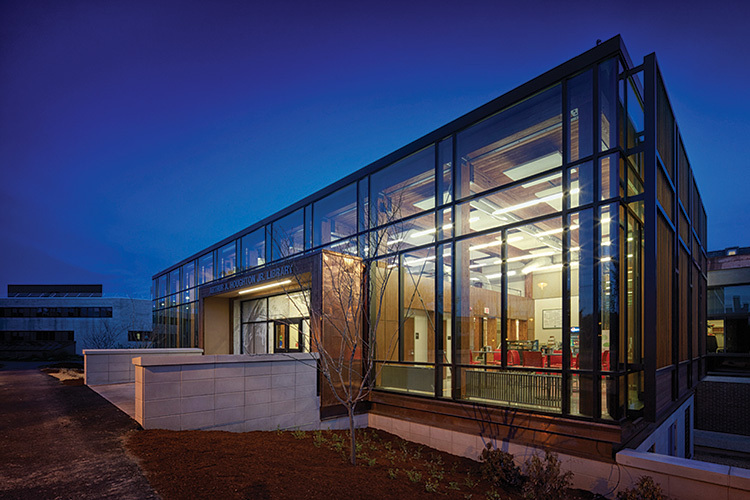 Photo: Kendall Reeves/Spectrum Studio Inc.
Southern New Hampshire University’s Library Learning Commons is a large, impressive structure at the heart of the campus. 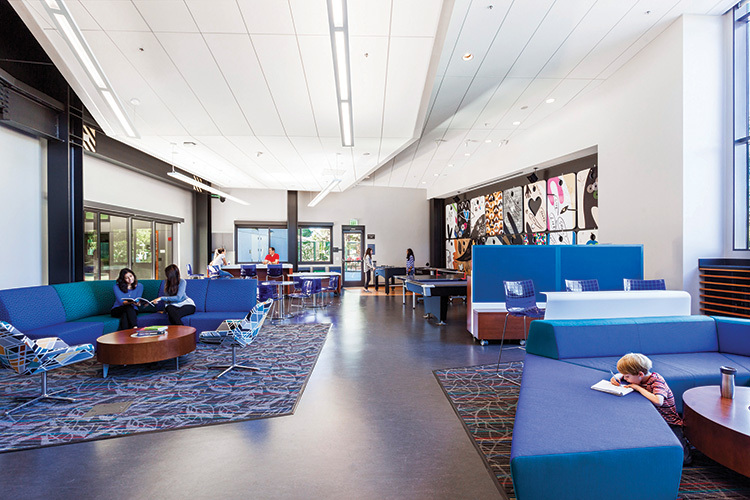 It houses the university’s relocated Shapiro Library and features a new innovation lab, a learning center, a makerspace, an IT help desk, and a café. The new Jerry Falwell Library is a structure devoted to student activity, with a wide range of flexible spaces to work and socialize. 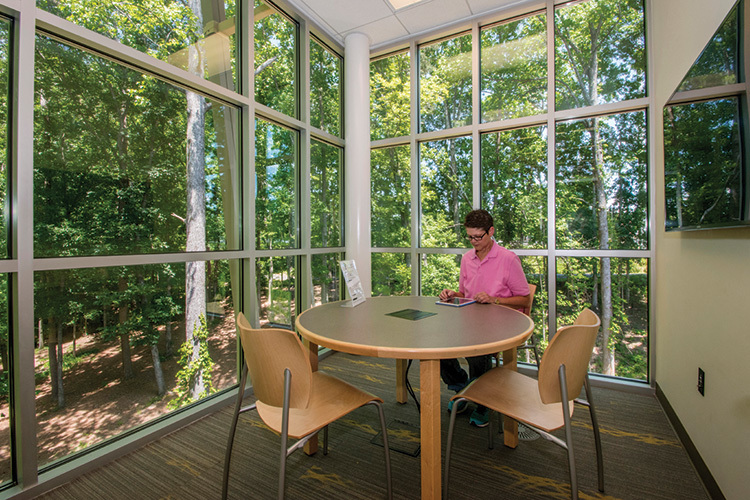 A large learning commons and public areas offer informal gathering spots, while personal study zones and small- to medium-sized group study rooms allow for quiet retreat. Natural light streams in through glass window walls on all four sides of the new law library at Syracuse (N.Y.) University. 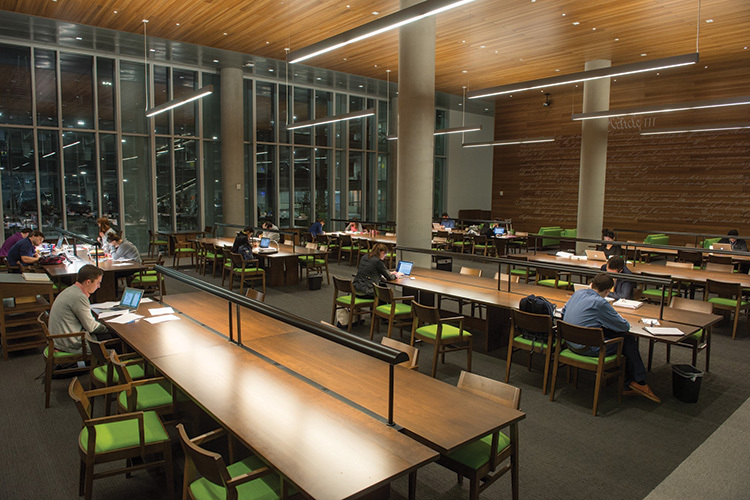 Part of a new LEED–certified College of Law building, the library has 44,211 feet of shelving, 300 seats, a 20-seat classroom, eight group study rooms, a climate-controlled rare book room, and is connected to a ceremonial appellate courtroom and public space. 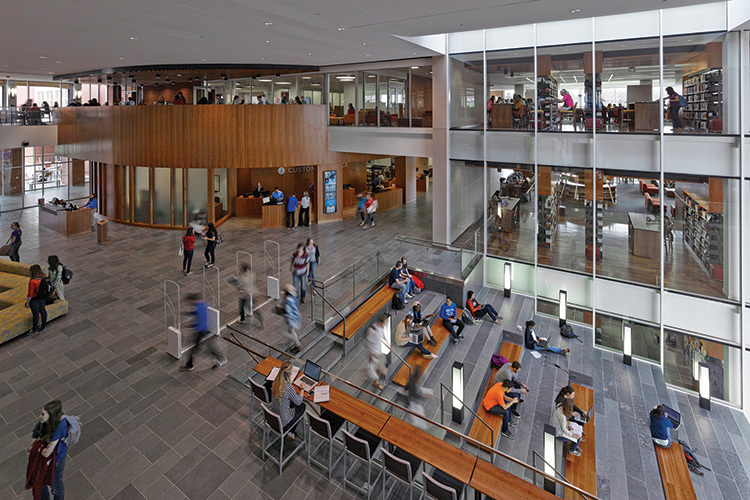 Corning (N.Y.) Community College’s Arthur A. Houghton Jr. Library is a hub for student learning that provides ample space for collections, student work, and technology. It also looks like it’s light as air when viewed from the outside, with its towering glass walls that reveal large open inside spaces. 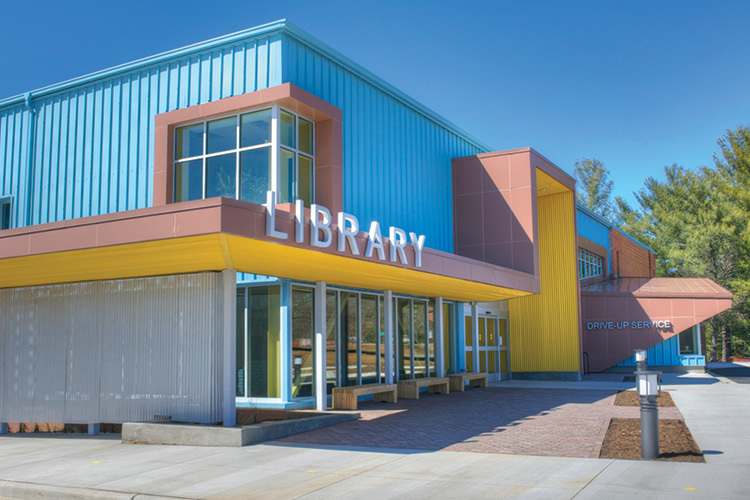 Architect: HOLT Architects, P. C.
The design for the East Roswell (Ga.) Branch Library connects the facility with the surrounding wooded areas, creating a library within the trees. A covered bridge entry leads patrons into a library where open sightlines, stone, wood, other warm natural materials and products, and expanses of glass blur the boundary between exterior and interior space. The East Baton Rouge (La.) Parish Library’s Main Library takes full advantage of its location within a community park to offer an immersive experience with nature. A three-story glass wall offers views of a botanical garden, while a central plaza connects the library to gardens, soccer fields, and a new café. A rooftop terrace completes the effect. 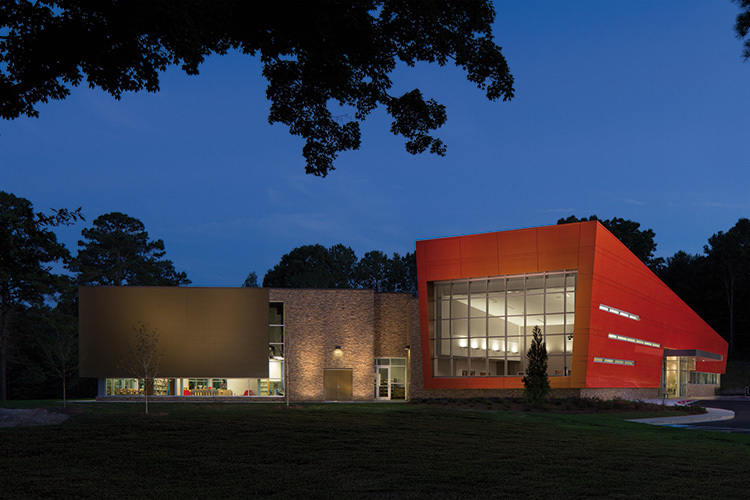 Designed in collaboration with Fulton County and area stakeholders, the Wolf Creek Branch Library symbolically embodies the progress and connectedness of the deeply rooted African-American community of Wolf Creek. The building blends into its lush surroundings, while features like the striking slanted roof reflect the community’s upward mobility. Wolf Creek Branch, Atlanta-Fulton Public Library System. Photo: Ron Rizzo/Creative Source Photography, Inc. The Bellevue Branch Library reflects a community reenergized after being devastated by a flood in 2010. 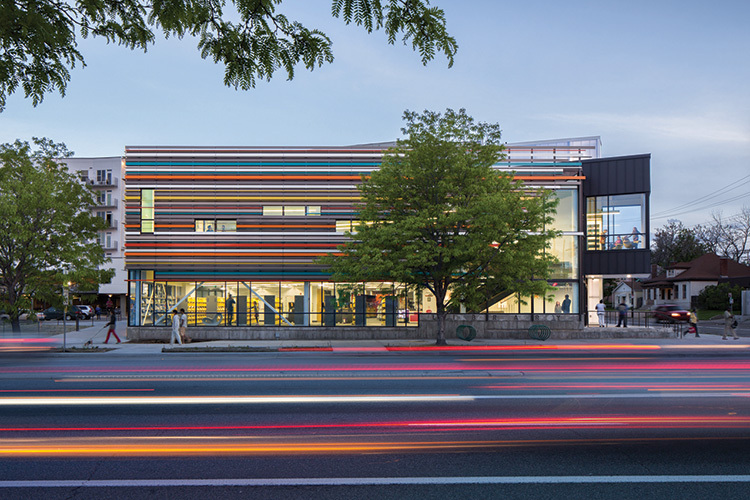 The building’s elongated modular form recalls stacks of books, emphasizing the importance of learning, wonder, collaboration, escape, and critical thinking to community development and revitalization. The colorful Rodolfo “Corky” Gonzales Branch embraces the “library as greenhouse” concept, with a three-story plenum wall that serves as a light, water, and air filter. 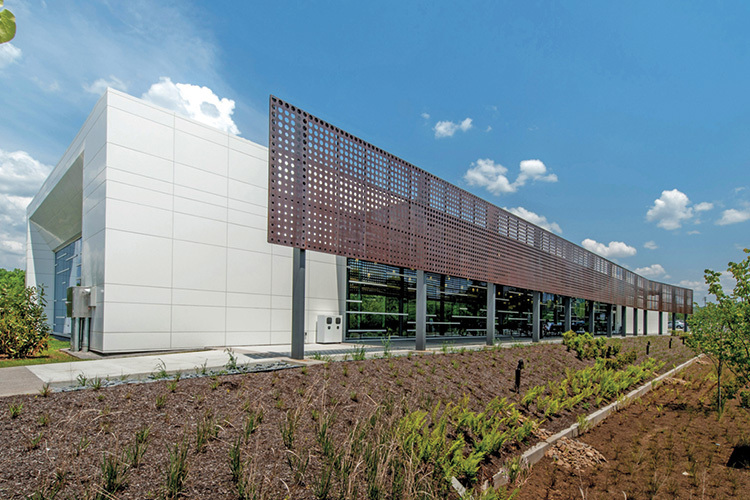 The “living” wall bisects the building and safeguards water, facilitates a passive displacement ventilation system, invites and filters daylight into the library, and showcases the building’s automated systems to patrons.